Black and white photograph with ball point pen noting Mixing Room at the Boston Mat Leather Company, Peabody, Massachusetts, 1918. Also in pen, notation saying Pigments and Finishes and Isaac Baril, Chemist. Baril stands alone in the room, before a small container stirring. 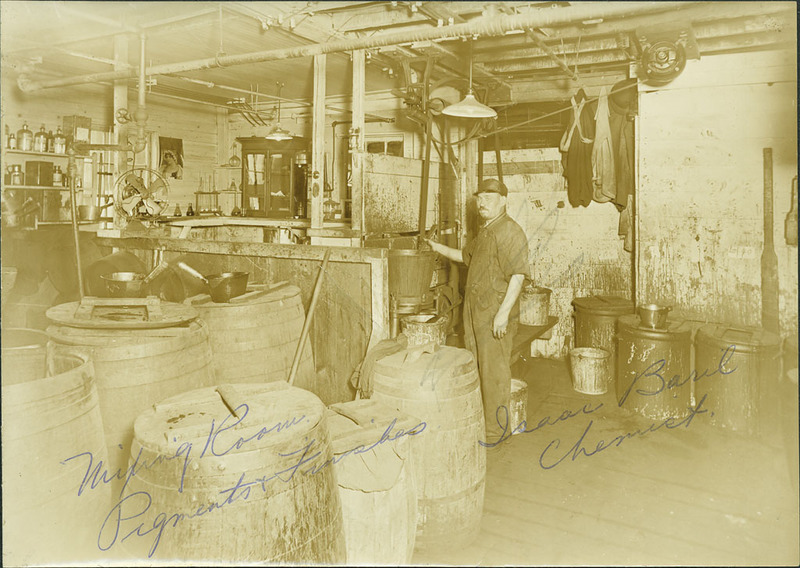 Around him are large wooden barrels with metal hoops, shelves of bottles, glass flasks on counters, and Edison fan and work clothes hanging up on the back wall. There is an Israel Barell listed in street directory as a morocco worker. He and his wife Annie lived at 90 Aborn Street. “Mixing Room,” Peabody Institute Library, Peabody, Mass., accessed April 18, 2019, https://digitalheritage.noblenet.org/peabody/items/show/175.